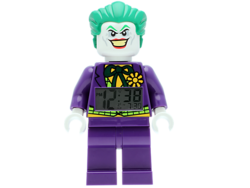 The Joker Minifigure Clock is a Super Heroes DC Universe clock released in 2013. It is based on the The Joker Minifigure. This is a description taken from LEGO.com. Please do not modify it. (visit this item's product page) It's always time to plan crime in Gotham City with The Joker! Wake up ready to save the day in Gotham City with The Joker Minifigure Clock! Make your LEGO® décor collection fun and functional with a digital, lighted display and alarm clock. Makes a great gift for fans of the LEGO DC Universe Super Heroes building sets! Makes a great gift for fans of the LEGO® DC Universe Super Heroes building sets! Facts about "5002422 The Joker Minifigure Clock"
It's always time to plan crime in Gotham City with The Joker! This page was last edited on 19 August 2017, at 13:56.